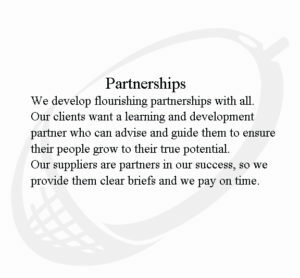 How do we ensure that the service we offer matches our clients development needs? Initially, the training needs are discussed with the person who commissions the training (sponsor). We then need contact by telephone or e-mail, ideally, with each person attending the programme to establish their expectations and needs. If these needs differ greatly from the needs of the sponsor we will then go back to the sponsor and agree what the final design should cover. When the course starts we find out the current issues facing each delegate regarding the subject being covered. This is to ensure we are aware of, and can deal with, real problems currently being experienced by each delegate. We will contract with the delegates as to the issues we can deal with during the course, given the constraints of time and other subject matter already being covered. For courses of more than one day’s duration, we review each morning the material covered on the previous day to ensure that the delegates are satisfied with what we have done and will make changes as appropriate. At the end of the course each delegate will complete our end of course evaluation form and a copy of this will be given to the course sponsor. Each course is followed up with a phone call to the sponsor to discuss their satisfaction with the course outcomes and application to the job. Changes will be made to courses being run on a repeat basis to reflect the feedback given to us. We also provide a follow-up service for each participant in the form of email support for a 12 month period following any learning event. Our practical approach to the evaluation of the training services we provide, both in terms of the performance of an individual and the influence of our training on business performance. Objectives are agreed with the sponsor at the beginning of the programme design and, together with the delegates’ own personal objectives, used as the basis of the course design. As far as is practical, objectives are evaluated on the course by the trainer who will test knowledge, understanding and any skills taught. The skills evaluation is carried out in a “live” environment whenever possible. For example, when training recruitment and selection interviewing, the delegates practise their interviewing skills by carrying out an interview. We do not use role plays but prefer to run a “real play” which involves the delegates in interviewing people from outside the organisation or their department who would fit the profile of a given live job description. Each interview is video taped so that feedback can be given by the trainer. The video is then given to the delegate for them to review after the course as part of their Continuing Professional Development (CPD). Using “real plays” enables the learning to be practiced in as real a situation as is possible on a course. This means that the transfer of learning to the job is achieved more easily. The managers of the delegates need to have agreed with them prior to the course what they want them to be able to do as a result of attending the course. Following their attendance, their manager should refer back to the objectives and the needs they have agreed with the delegate and then review the implementation of the learning. We can carry out further evaluations at departmental and organisational level using questionnaires and interviews however these services are charged for as a separate contract for work. End of course evaluation forms are used to assess delegate satisfaction levels. How do we feedback the results of our evaluation to the client organisation and is customer data available relating to the quality of our courses? We prefer to visit our client to provide face to face feedback and also provide a back-up paper report. At the same time we identify to the client additional training needs which are now showing themselves. The customer data available regarding the quality of our courses is in the form of testimonials. Additionally, we can ask individual clients permission to pass their names to you so that you can talk to them about us as we measure the quality of our products on the basis of how easily transferable the training is to the work environment. Details of our follow up service. The level of after-care is dependent upon the requirements of each client and the type of training we are providing. For example, the after-care for an ongoing culture change programme will be more concentrated and necessary than the after-care for a one-off course on, say, Time Management. Some clients do not want any after-care at all. We feel more comfortable with providing at least a telephone conversation with the course sponsor to obtain feedback from them about the changes in behaviour of the delegates following the course. We can then give additional advice to them on the management of the delegates regarding their new skills. For the participants, we are able to provide an email support service for a 12 month period following a learning event when we can answer any queries they have and provide suitable additional material if necessary. We will also publish relevant additional information on our web site and notify interested participants of its existence. For more information about our tailored training courses call 01604 810 801 or click here to contact us.